Animal Health Foundation: Laminitis Research : Are you ready to join the "Laminitis Revolution" webinar? 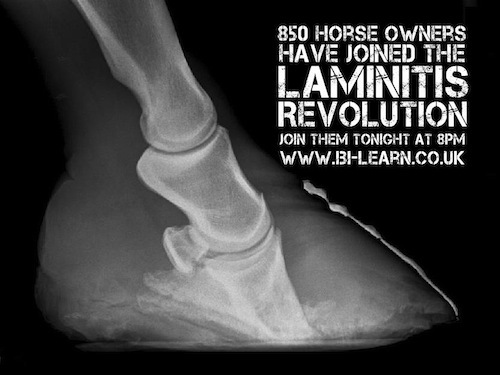 Are you ready to join the "Laminitis Revolution" webinar? A much-anticipated webinar on endocrine laminitis is scheduled for Wednesday, April 10, at 8 pm London time, which is probably about 3 pm New York time or 2 pm St Louis time. British veterinary surgeon David Rendle, from the Liphook Equine Hospital in Hampshire, England, will discuss how the veterinary profession’s understanding of laminitis has been revolutionized in recent years and provide useful tips to help you manage this debilitating disease. Learn lots, lots more about laminitis and Cushing's disease at the website www.talkaboutlaminitis.co.uk. Visit www.bi-learn.co.uk/categories/equine to "join the revolution" (by attending the seminar).